The Painted Quilt: Pincushion Distraction! On Saturday, my DH and I decided that it was time to put our winter duds away and break out the summer stuff…just in time as well because the temperatures soared to the low 80’s, a bit early for these parts. While going through his closet, Sam decided he was going to downsize his necktie collection and selected about ten or so that he didn’t want any longer. As I was placing them into a bag that was destined for the nearest Goodwill store, I got to thinking about other possibilities for these ties. Off to my studio I went, ties in hand. To my utter amazement, they came apart quite easily. I ended up with piles of fabric, most of it silk. All of a sudden, the light bulb went on. Be still my heart…a pincushion! And so it began. As I started to cut some of the fabric, I decided that I would try to make a ‘crazy quilt’ style pincushion. I cut out a heart template and started piecing. What fun I had watching the project come together. After I had completed the top, I added some decorative stitching with some shiny rayon DMC thread that I had in my thread collection. I then sewed it to some backing, stuffed it, added a few doo-dads and voila…a crazy quilt pincushion! It didn’t take long to make and I had fun during the process. Sam couldn’t believe how his ties had been recycled and that my fabric stash had grown without spending a penny! More good news! Carrie from A Passion for Appliqué told me about a pincushion swap! Can you believe it? Sandra from Quilt At Home is hosting the pincushion swap. She lives in the Netherlands and is inviting stitchers from all over the world to join in. So if you’re even just a little bit like me and pincushions are your passion, visit Sandra’s blog to read all about it. It didn’t take me long to sign up! What a terrific idea and so beautiful. I was imagining the smaller pointed ends of the ties being dresden fan blades. :o) I'd love to participate in a pincushion swap but don't really have the skill to make something worthy. You clever girl you! Wonderful pincushion! This is fantastic!! After this post, I can imagine alot of husbands saying...hmmm where did that tie go?!?. I don't think Scott would notice, he has a large rack of them!! That is so very pretty! ha,ha, you sound like me!! I just can't bear to part with textiles :-) The last post on my blog is about a skirt I found for $1 which I am going to make into some kind of tote. I guess we have it really bad. Very pretty pincushion! You are so talented Kaaren! I love it!! I love pincushions, but have never made one, I will watch the swap unfold, have fun with it. I love how that light bulb just goes on in your head. The pin cushion turned out wonderful!! I love it. Pin Cushion Swap huh? Hmmm.....I have never made a pin cushion, but I guess I could start. Actually I started to make the one you did as a tutorial. But I have not finished it yet. I need the insides first. Well, aren't you clever! Have a fun swap!! Love your new blog look. What a great use for those ties!!! I can't wait to see what you do for the pincushion swap!!! Kaaren, that pincushion is the cutest! 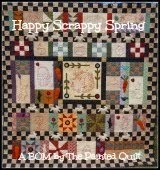 and it reminds me so of an old crazy quilt I had as a child. Glad you rescued the ties! Beautiful pincushion! Genius, Kaaren! And your Sam isn't afraid of gorgeously, brightly colored ties! How clever Kaaren . My you are so talented. I just may join the pin cushion swap. Brilliant use of the ties!! That is one of the prettiest pincushions I've seen in ages! Such a beautiful Crazy PW Pincushion!! I had forgotten that neckties had been used to make crazy quilts. The pincushion idea is great. Now I'll have to go through all those ties Jack doesn't wear anymore.